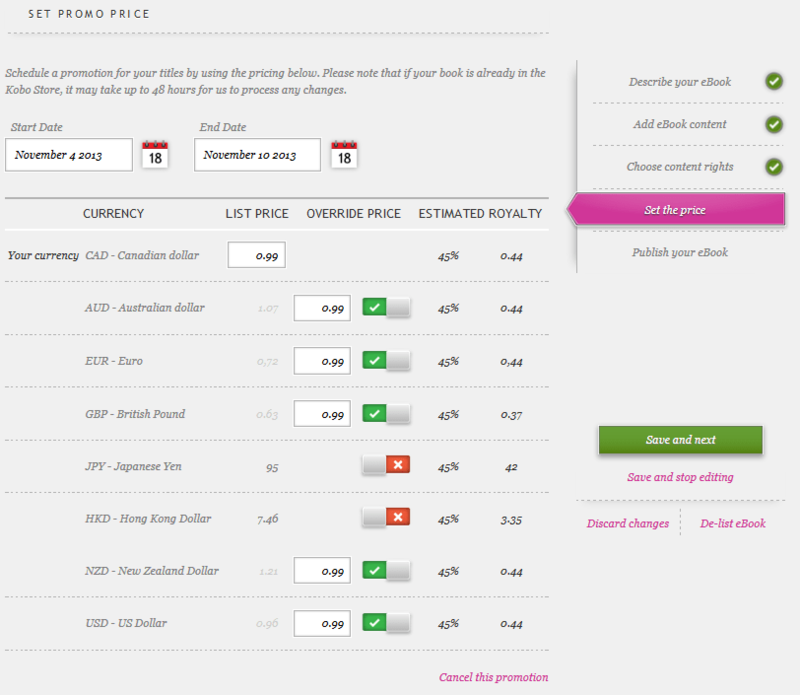 You can now schedule price promotions and permanent prices in KWL. Just set it and forget it! 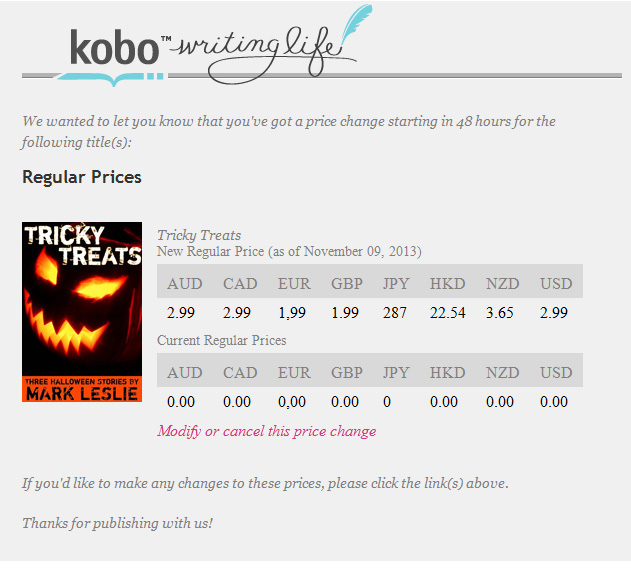 Once set, your KWL library will display a badge to show which books have a price change scheduled. If you’re a forward-thinking individual and like to plan things far enough in advance, you’ll receive a reminder email 2 days prior to when your book is scheduled for a price change. Remember to add Kobo Writing Life to your email client’s white list so these important reminders don’t get caught in your spam filter! This is just another way the KWL team is continually working to ensure you have as much control as possible over every aspect of your titles, and right at your fingertips. I have a question–This free books list, doesn’t show free books–but I’d like the two I have free for promotions to be listed in such a list. Any way to make that happen? What would make this tool truly spectacular (and useful) is if customers actually saw the price reduction indicated on the product page. Otherwise, there’s no way for them to tell they’re looking at a reduced price. Also, why not highlight these books on your home page? I don’t think he means spot lighting them on the main page–although that is also VERY nice. My own thought (and maybe his) is a crossed out price on the book page that makes it very clear to the potential purchaser that it’s a SALE. Dates that show it’s a 4 day sale or whatnot would also be useful. 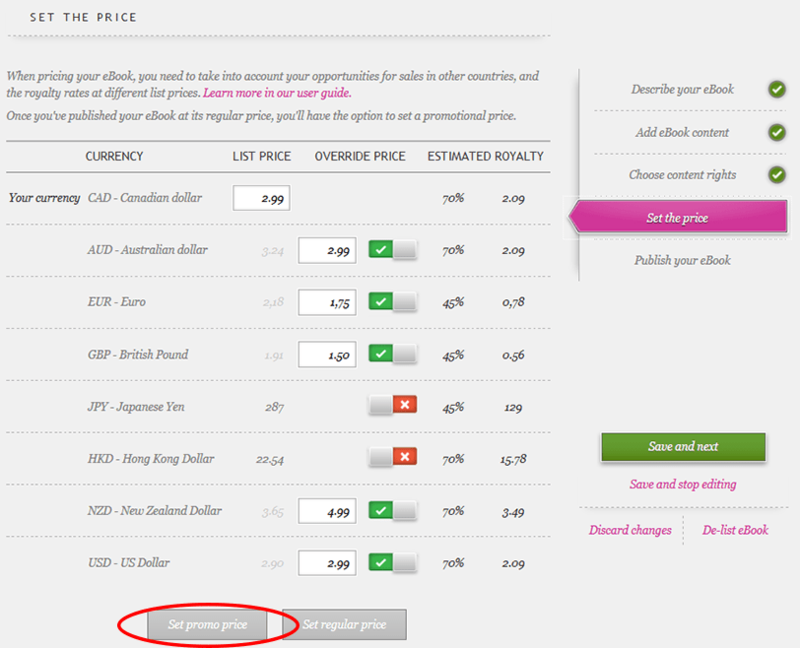 The new pricing mechanism is a great tool–I’ve used it, but it would be nice if it was also a READER tool, telling them, “Hey, this is a great bargain right now, but it’s a sale price. It will not always be this low and will revert to a higher price.” –A crossed out price conveys that idea. Maria’s comment is exactly what I mean. Without the slash through the regular price alongside the sale price on the actual product page, the “promotion” isn’t really a promotion. It’s just a reduced price that no reader is going to know is a reduce price. The Daily Deal is a step in the right direction, but how about drilling down further with it so each genre gets one? Just an idea. Hey Maria/Scott – no, we understand completely what you guys mean and those suggestions have already been placed from the KWL team over to the web/development team for implementation. Kobo’s web catalog continues to change and improve – we don’t have an ETA on when that particular change will go live, but keep your eyes on it. satisfied thzt you just shared this useful info with us. Please keep us informed like this. Thanks forr sharing.